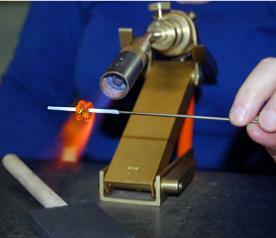 Here's a chance to make a glass bead yourself at a torch without needing to invest an entire day! I offer mini-workshops to do a "test drive" behind the torch. After a short safety briefing, we'll melt some glass and make (and decorate!) a few beads. Each workshop lasts 90 minutes and is limited to 2 participants. Open to those age 14 and up. Registration: Click here to sign up. Give your name, tel.nr. and some possible dates/times you'd like to come.